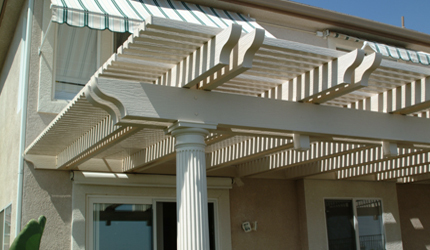 Lattice Patio Cover Lay-Out .PDF file. Aluma Drift Wood "Classic Lattice"
Classic Lattice will preserve its beauty, it has an unsurpassed ability and durability to retain its color for years to come. Classic Lattice has a Beautiful Embossed Texture. 2" x 2" Lattice with 2" space. Must add posts and any extras for your design. Ledger: Select One Yes No Will Match Width. Extra Rafter: Select One 1 Rafter 2" x 6.5" 2 Rafter 2" x 6.5" 3 Rafter 2" x 6.5" 4 Rafter 2" x 6.5" 5 Rafter 2" x 6.5" 6 Rafter 2" x 6.5" 7 Rafter 2" x 6.5" 8 Rafter 2" x 6.5" 9 Rafter 2" x 6.5" 10 Rafter 2" x 6.5" Will Match Proj. Must Select Again. "Must Match What You Selected Above"